Get out of your home and go to events where success-driven people gather and go to events where your fellow coaches and trainers gather as well. You don’t have to be overtly marketing yourself the whole time, but take time to get to know the people there and forming connections with them. In many cases, these connections can later turn into new clients in a variety of ways you might not even have anticipated. My friend Ivan Misner, the Founder and former CEO of BNI, Business Network International, and author of Networking Like a Pro, says that networking consists of three steps or stages: Visibility, Credibility, and Profitability. First, you have to show up and be seen. Introduce yourself to people. The second step of successful networking is credibility. You gain that by contributing something of value to the other person, often by making a promise and keeping it. Ask people what they are working on at the moment or what their biggest challenge is at the moment, and then later you can refer them to a resource like a good book, or send them an article or introduce them to someone that can help them. Once you have credibility in their eyes, then you can ask them for referrals for your coaching or training business. Another great way to network is by forming or joining a mastermind group. They are becoming increasingly easier to find, and should be an integral part of your business plan for getting started. These groups and the advice that they offer are able to help you grow your coaching/training business in a number of ways, including finding new clients. Join one if you have the opportunity, and learn everything you can from it. You can also form your own. It’s worked for businesses for decades, and now, thanks to services such as Facebook Ads and Google AdWords, it’s more effective than ever. The advantage that Facebook Ads, AdWords, and a few others bring to the table is that they allow for highly specific targeting. Rather than paying to send your ad out to the masses, you only have to pay to send it out to those that you have already identified as your target market. If you’ve managed to carve out any sort of niche with your coaching and training business, this can be especially useful for gathering qualified leads that you can later convert into paying clients. My third tip for beginning to build a coaching practice is one I learned from David Wood, a very successful coach and trainer of coaches. It’s amazingly simple and amazingly effective. You start by making a list of everyone in your life who has contributed to your success in any way—colleagues, teachers, mentors, friends, people at your church temple or mosque, past customers and clients. Then you call them and say that you really appreciate the difference they have made in your life and that you have just become a coach, and as a way of thanking them for their contribution, you’d like to offer them a free coaching session. In my experience and the experience of my students, almost everyone says yes, and then many of them, assuming you have provided real value in that coaching call or session, you can ask them if they would like to continue and do some more session, and if they say yes, you now have a new client. In the business world, this is known as a loss leader. You are taking a loss on the first session or a sale item in a retail store, to gain a future stream of income. You can also do this if you have a mailing list of any kind by offering a free group coaching call or webinar on a particular topic, such as how to lose weight, or how to become aware of and release the unconscious limiting beliefs you have that are holding you back in life. The key is to make it available to the first 20 or 30 people that sign up, so you create an urgency and exclusivity to the event with the promise of some individual interaction. I learned this from one of my friends named Marcia Wieder. I consider her the Queen of Enrollment. Here are a couple of her ideas that I have found useful. #1: In order to be successful at anything, you need to connect deeply with what you care about. And then communicate succinctly why they should care about it too. When talking to someone about your work, offer them a compelling invitation for them to join you. The emphasis is on inviting. You have to offer them something they can participate in. The compelling part usually has to do with a sense of urgency around the offer, — which is usually around timing and a special price and scarcity. But it always has to be the truth. She once told me she is enrolling new clients all the time everywhere she is—even at the checkout counter of the supermarket or in line at Starbucks. If they answer yes, she asks them more about it and tells them briefly how she can help them. If they answer no, she mentions that people with passion and dreams live longer, happier lives, and then enrolls them in wanting a dream… that she can help them find and create. Obviously, this question will work at any event you might be attending as well. If you’re attending the right events, networking with the right crowds, and really just interacting with curiosity and a passion for what you are offering people, opportunities for telling people about your coaching practice or training are going to be everywhere. You just need to be ready for these opportunities and capitalize on them when they do present themselves. I teach my proven methodology for helping others to get better results in my online and live Train the Trainer Program. This is my proven system to help you improve your business and increase your income. Train the Trainer isn’t just for speakers, trainers, or coaches (or people who dream of pursuing one of those options). It’s for anyone who works with others and wants to make a difference by helping people aim higher, achieve more, and get the results they want. Learn more about using my proven methodology to train others and make a difference. You need to create a great elevator pitch – a short, 20-30 second pitch of your services that lasts about the same amount of time as an elevator ride. Practice this pitch, hone away the parts that aren’t necessary, and learn to highlight the parts that seem to get people’s attention. If you can pin down a great elevator pitch, you’ll be able to spark the interest of potential clients when the opportunity arises and convince them to give you their contact information. In some cases, you may even be able to get them to sign up for your services right there on the spot. Craft a statement that tells people in a compelling way who you work with, and how you serve them. At first, finding new clients can be one of the most difficult parts of running a coaching or training business. The real secret of how to find new customers and clients is that it takes consistent effort over time, but the effort is worth it because you get to make a significant difference in the lives of many people. Which one of the methods I’ve shared with you today to get more clients for your coaching business will you try? Let me know in the comments. If you want to learn how you can start your own training business, click the button below to watch my free training webcast. Learning how to become a professional speaker and trainer holds the power to transform the lives of many people. By building my speaking business and eventually offering books, packaged courses, and live training programs, it has skyrocketed my career over the past 40 years. More importantly, the satisfaction I get from sharing my Success Principles and transformational exercises is unmatched by anything else I do. The best speech I’ve ever seen was given by the brilliant economist Paul Zane Pilzer at a large chiropractic event in Las Vegas. Before an audience of nearly 10,000 people, Paul delivered his message, The Next Trillion, about the onset of the wellness revolution, how statistics and pure economic trends prove it will happen, and why chiropractors are so well positioned to enjoy the benefits of this next trillion-dollar trend in society. He weaved a fascinating mix of his own experience in working with consumer product companies, information he had researched on the medical and alternative healthcare communities, economic facts and figures that are readily available in print, and his own inspirational stories about the subject. It’s no wonder Paul received a thunderous standing ovation. It changed the thinking of the chiropractors in the room about how they could excel in their practice as “wellness” began trending in their local market. I was energized, motivated and excited about the future—and I’m not even a chiropractor. Whether it’s a group of teachers and educators, businesspeople, or even cabinet ministers that I’m speaking to, I’ve got to see their breakthroughs in real time and hear about their later successes through the many emails and letters. It’s a great feeling, but it has also built a great career. Perhaps you, too, have thought about how to become a professional speaker or a motivational speaker in the human-potential arena helping to transform the lives of others. If so, I’ve got some pointers for you based on my work with all kinds of groups – in more than 100 countries! First, content is key. There’s so much information and noise out there, people can get advice almost anywhere. But, when your content – the principles and insights that you teach – changes people’s thinking and gives them a whole new way of approaching their lives, careers, and relationships, that’s the kind of content that gets internalized and used by your audiences. It’s not just feel-good stories and great entertainment from the platform – but real transformation taking place. That’s why content is key: You have to prove you can deliver this result before anyone will hire you to speak in front of their group. Second, you need a way to market yourself as a speaker. There’s a reason that some people quickly become recognized as the leading expert in their field with all the fame, fortune, and opportunity that goes with it – while others in the same industry struggle to get by. There’s a reason that some speakers build a great speaking career, but also go on to get book deals, licensing deals, distribution deals, speaking tours, spokesperson contracts – while others wait years to get hired as a speaker or find a publisher for their book. You have to identify what you know that’s marketable – then identify which meeting planners and groups need that knowledge and are willing to pay you for presenting it at their next event. Third, if becoming a professional speaker is what you truly want, why wait another second to take action? You too can have a future as an industry professional, a platform star, and the world’s next motivational speaker. I’d like you to watch my in depth webcast called the 7 Pillars of True Life Transformation. It explains the process of becoming a speaker and transforming audiences around the world – as so many emerging speakers have done whom I’ve helped launch over the past five years. In this webcast, I’ll teach you how to quickly remove blocks, fears, and uncertainty in yourself and others. With my proven methodology, I will also guide you on how to make a living as a trainer and how to transform others through training. If this is you dream, ask yourself: How can I empower others? And what principles can I share with the world? Click the button below to learn more. While you may be able to create tremendous success on your own, traveling the path of success through networking and a mastermind group makes the journey more enjoyable. Plus, the added accountability will propel you to success faster and further than you originally envisioned. This is where the importance of networking and a masterminding comes into play. It’s not what you know, it’s also who you know. In my career, success in any undertaking has come down to not just who I know—but also who I have on my team. Along the way, I’ve learned many success principles that can help you build your own network of influencers, mentors, and experts. Developing a business network of people can help you succeed. One of the most important skills for success in today’s world, especially for entrepreneurs and business owners, is networking. In my life, this has proven to be true. The more time I have spent consciously building and nurturing my business network of advisers, colleagues, clients, students and fans, the more successful I have become. Businesses and careers are built on relationships. Relationships form when people meet and interact with each other in an authentic and caring way. Statistics confirm over and over that people prefer to do business with people they know, respect, and trust. In creating your own personal network groups, your job is to seek out people who know things you don’t. These people can help you connect where you can’t. Initially, your goal shouldn’t be to make a sale. Instead, it should be to seek advice, connections, recommendations and insights. To the extent that you can provide something in return, do so. Remember that developing genuine relationships takes time and consideration. It requires careful thought and a mindfulness for others. Second, ask others how you can help them and then deliver on their requests if you can. Then, when you have developed a relationship of trust and service, you can ask for referrals and assistance. Networking and building meaningful relationships with others brings success quickly. This is where mastermind groups come in. We all know that two heads are better than one when it comes to solving a problem or creating a result. Imagine having a permanent group of five or six people who meet once every week or two to problem solve, brainstorm, network and motivate each other. The basic philosophy of a mastermind group is that more is achieved in less time when people work together. A mastermind group is made up of people who come together on a regular basis (weekly, biweekly, or monthly) to share ideas, thoughts, information, feedback, contacts, and resources. Getting the perspective, knowledge, experience, and resources of the others in the group greatly expand your own view of the world. It can also advance your own goals and projects more quickly. When you form your mastermind group using your networking skills, consider bringing in people from different professional arenas. Find people who are “above” or “ahead” of you professionally or financially. These people can introduce you to a network of people and resources you normally wouldn’t have access to. Though the benefits of masterminding with people outside your field may not seem obvious now, the truth is that we all tend to get stuck in our own field of expertise. We see through the same narrow lens and do things the same way everyone else in our industry does. When you assemble people from different industries, professions, or fields of study, you get lots of different perspectives on the same subject.I don’t know anybody who has become super successful without employing the principles of both networking and masterminding. I don’t know anybody who has become super successful without employing the principles of both networking and masterminding. This is because building meaningful relationships with others both inside and outside of your field of expertise forms valuable connections and expands your resources. You never know when these connections will come in handy on your journey to success. Make a list of 5-6 people who you know that you could potentially build a mastermind group with, and ask them if they are interested. One of the most powerful ways to learn anything is to teach it to others. That’s why having a mastermind is so important. Teaching forces you to clarify your ideas, confront inconsistencies in your own thinking, and more closely walk your talk. But most importantly, it requires you to read, study and speak the information over and over again. The resulting repetition reinforces your own learning. I’ve created a free webcast for people who want to learn to train others, lead mastermind groups, and conduct powerful learning sessions with others. Learn how to develop unshakable self-confidence at Breakthrough to Success! Research has repeatedly shown that the more you acknowledge your past success, the more confident you become in taking on and successfully accomplishing new ones. A simple way to start this process is to take an inventory of your major success. Divide your life into three time periods – from birth to 15, 16 to 30, and 31 to 45. The list three major successes from each time period. Divide your life into three time periods – from birth to 15, 16 to 30, and 31 to 45. Then list three major successes from each time period. To really convince yourself that you’re a successful person who can continue to achieve great things, keep going with your list. See if you can identify 100 or more of your life successes. Keeping and referring to your victory log keeps you focused on your successes instead. To understand the importance of esteeming yourself, imagine you were playing poker. If you have 10 chips and I have 200 chips, who do you think will play more conservatively? You will, of course, because the stakes are higher for you. Two losing bets of five chips each would put you out of the game. I, on the other hand, could lose five chips 40 times before I was out. Your self-esteem is like a stack of poker chips. The higher it is, the more willing and able you are to take the risks that will lead you to greater success. Your ideal future is within your grasp – you simply have to reach out and grab it. I want to give you the tools you need to make that happen. If you really want to take control of your life and inject it with unprecedented amounts of happiness, financial success, a sense of accomplishment, the ability to help others, and a real sense of purpose and satisfaction — the time to act is now. Join me for 5 days of hands-on training with me during Breakthrough to Success! During this one of a kind workshop, I promise you one thing… you’ll leave feeling transformed, and ready to make a massive impact on the world. BTS 2017 is 5 days of hands-on training with me, LIVE and in-person. I’ll be there, holding you accountable, and guiding you each step of the way toward your own personal evolution. Click the button below to learn more. I want to really dive into the one common trait that all successful leaders share and that trait is the ability to identify what’s not working and deal with it quickly. As someone in a leadership position – whether you’re a trainer, corporate manager, MLM distributor with a downline, owner of a small business, manager of a sports team, or parent – you want your team to thrive while working together to generate great results. That means you need to have a strong understanding of what’s working – as well as what’s not. It’s sometimes tempting to focus only on the positives and ignore the negatives in the hope they’ll magically resolve themselves. On rare occasions, that actually happens. But, far more often, a negative situation left untreated will fester and grow into something that threatens the health and performance of your entire team. You’ve got to face what isn’t working and deal with it as soon as possible. Do you defend or ignore how toxic your work environment is? Do you make excuses for your team members’ poor performances? Are you in denial about a personal conflict between individuals that’s negatively impacting the dynamics of the team? Has a team member developed a bad attitude that’s affecting others? Great leaders face these circumstances squarely, heed the warning signs, and take appropriate action, no matter how uncomfortable or challenging it might be. Pay attention to the “yellow alerts”. Sometimes we choose to acknowledge these alerts and take action, but more often than not, we simply choose to ignore them. We pretend not to notice that something’s amiss. Because to face what’s not working in your team, organization, or own personal leadership means you’re going to have to do something uncomfortable. You might have to confront somebody, risk not being liked, demand respect, let someone go, or maybe even quit your job. But if you aren’t willing to do these uncomfortable things, you’ll end up tolerating a situation that doesn’t work to the point where it causes serious damage. To learn more about the traits of great leaders, check out my article about the 5 habits of successful people. You might also enjoy this leadership qualities infographic by Brian Tracy. Keeping this leadership trait in mind, I want to leave you with a bit of homework to complete. Write down at least 5 things that aren’t working in your organization right now. Then, resolve to talk to the appropriate people to get find a solution for those issues. To hold yourself accountable, leave a comment below with 1 thing that you could improve upon from your list. I’ll follow up with you guys to make sure you’re staying on track! If you are committing to becoming the best possible leader you can be, I encourage you to take my leadership quiz. It will show you your leadership potential and help you identify your talents so that you can strengthen them to higher levels. You can quickly take it and find out how to become an effective, well-respected and beloved leader who is able to inspire any team or audience to be their best selves and achieve incredible goals. Click the button below for more details. Each of us has the power within us to create the life we want, the life we dream about, and the life we were born to live. And you, even as a sole individual, can have a tremendous impact on others through personal coaching and training. Each of us deserves to reach our full potential and manifest our true destiny. It is our birthright, but it must be claimed. It must be earned through hard work and training. Part of that work is first learning, and then living by the time-tested and ageless success principles that are guaranteed to bring about our desired results. Most of us did not learn the principles of success in school. Only a few of us learned them at home. Instead, the principles of success have been passed down by mentors, teachers, coaches and more recently in books, seminars, and audio programs. Learn how to quickly remove blocks, fears and uncertainty in yourself and others during my free webinar. As a student of success, you have much wisdom to offer the people in your life. The greatest gift you can give anyone is a gift of empowerment and love. What could be more loving than training someone you care about get free from their limiting beliefs and ignorance about success, and empowering them to create the life that they truly want from the depths of their soul? What if everyone in your family gave up complaining, took full responsibility for themselves and their lives, and started creating the life of their dreams? What if everyone in your company practiced these principles? What if every man and woman in prison learned these valuable principles before they were released back into society? It would be a very different world. Men and women would band together in teams to support each other to become all that they could be. People would ask for what they need and want and feel free to say no the requests of others when it is not right for them to respond with a yes. People would stop whining and complaining and get on with creating the life that they want. People would tell the truth and listen to each other with compassion because they know that peace, joy, and prosperity would flourish if they did. People would tell the truth and listen to each other with compassion because they know that peace, joy, and prosperity would flourish if they did. The greatest contribution you can make to the world is to grow in self-confidence, self-awareness, self-realization, and the power to manifest your own heartfelt dreams and desires. As you shift, the people around you will notice and be inspired to model your actions. And as they shift, you’ll find that your little world becomes more of the place you dream it to be, full of support, peace, and love. The next greatest thing you can do is to actively facilitate the growth of others by taking on the role of a trainer or coach. But, they are not the only ones who will benefit by your investment of time and energy in taking on the role of a coach. Passing along your wisdom forces you to clarify your ideas, confront inconsistencies in your own thinking, and more closely walk your talk. But most importantly, it requires you to read, study, and speak the information over and over again. The resulting repetition reinforces your own learning. Because they have helped so many people get what they want, those they have helped naturally want to return the favor. I envision a world where everyone is inspired to believe in themselves, and their abilities, and is empowered to reach their full potential and realize all their dreams. I want the Success Principles taught in every school and university, and practiced in every small business and large corporation. I’d love to have you join me in empowering others and changing the world. I want to leave you with a bit of homework to complete after you’re done reading this. Make a list of 4 people in your life who you can help coach or mentor and empower to grow. What can you do for someone else to facilitate change in someone else’s life? 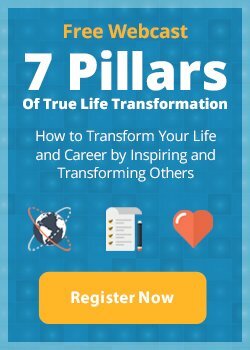 I’m teaching a webcast called the 7 Pillars of True Life Transformation that will teach you how to quickly remove blocks, fears, and uncertainty in yourself and others through coaching and training. I’ll show you how to use my training methodology to speak to all dimensions of a person’s being, earning you instant respect and love in the process. Join me for my free webinar by clicking the button below!